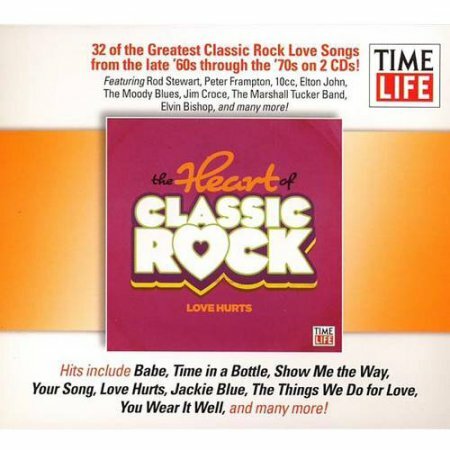 In the Spring of 2011, Time-Life began marketing The Heart Of Classic Rock collection featuring 4 double disc albums featuring some soft rock hits as well some harder rocking songs from the Sixties through the Eighties. Although the collection is no longer available individually, all four volumes featuring 112 songs can be had as bonus discs when The Power Of Love Deluxe set is ordered. Hot Blooded (orange) as seen below. Making matters even more confusing, the original cover for Love Hurts, as shown above, was altered to the generic one shown below once the sets began shipping. 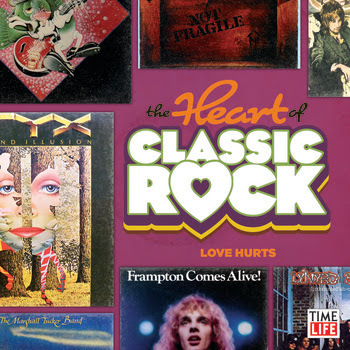 Featuring covers of classic rock albums, these are actually some pretty cool covers for a Time-Life collection - wonder if there was a legal issue with the Love Hurts artwork? 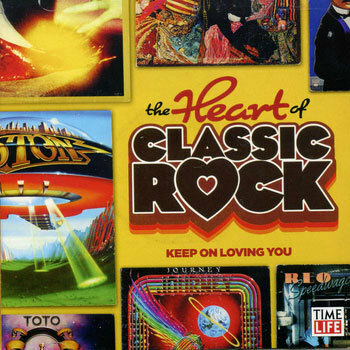 The Keep On Loving You disc features all SME artists with twofers from Blue Oyster Cult, Eddie Money, Electric Light Orchestra, The Guess Who, The Hollies, Meat Loaf, REO Speedwagon, Santana and your little dog, too, Toto. The soft rock ratio is pretty low on this disc, with less than a third of the songs making Billboard's Easy Listening / Adult Contemporary chart. The tracks on Rock 'N Me are from the WMG catalog and feature two songs each from Bad Company, Chicago, The Doobie Brothers and Tommy James & the Shondells. Foreigner makes three appearances across the two discs that make up this album. The soft rock ratio on Rock 'N Me is right at 50%. 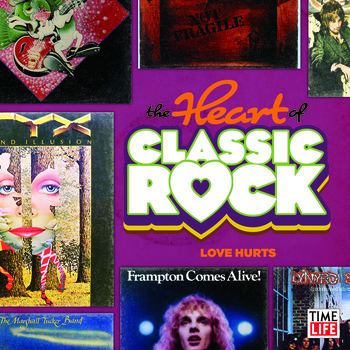 Love Hurts was assembled from UMG artists and features four soft rock songs by Elton John. Lynyrd Skynyrd appears three times on the album while the following artists are each represented by a pair of songs: 10cc, Jim Croce, The Marshall Tucker Band, Peter Frampton, Rod Stewart and Styx. 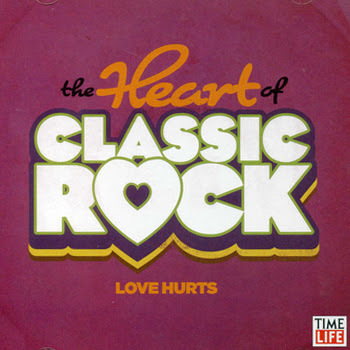 The soft rock ratio of Love Hurts is 21 of 32 = 66%. The WMG catalog was tapped again for Hot Blooded. Only three artists are represented with two songs this time around: Bad Company, Chicago, and Todd Rundgren. Foreigner once again makes three appearances on an album in the series. As on Rock 'N Me, the soft rock ratio of Hot Blooded is right at 50%. 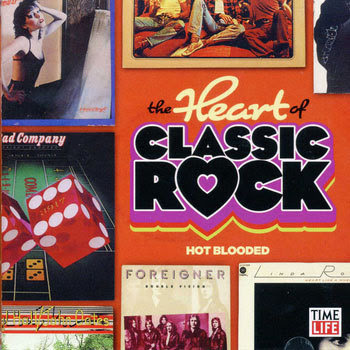 Of the 112 songs in The Heart Of Classic Rock series, slightly less than half of them charted on the "soft" side. Overall, the series is a good classic rock listen; the harder stuff is balanced out by the softer stuff although the Sixties songs do stand out and not in a pleasant way. They are not bad songs, just a little out of place among the rest of the songs given production values, mastering levels, etc. 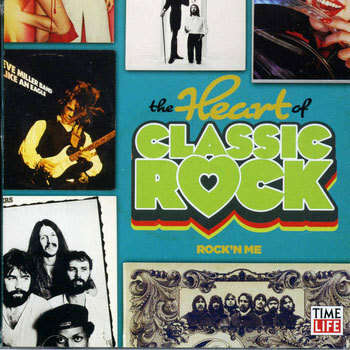 In 2015, Time-Life added a fifth volume to The Heart Of Classic Rock series and began marketing the series all over again via a half-hour infomercial hosted by former MTV VJ and current SiriusXM DJ Mark Goodman. The new volume is titled Don't Stop Believin' and the first disc appears to be licensed from the SME library while the second disc is apparently a WMG product. By using mostly 45 edits, they were able to squeeze sixteen tracks on each disc for a total of 32. 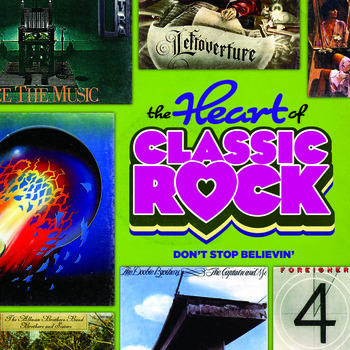 The acts grabbing two tracks each are Chicago, The Doobie Brothers, Journey, and Kansas. Only five of the thirty-two tracks made the AC chart which gives Don't Stop Believin' a soft rock ratio of just 16%. The songs from Don't Stop Believin' are included in the updated Bonus Playlist above. Also, the Rock 'N Me album from the original set has been retitled Get It On, with cover art from Steve Miller Band's Fly Like An Eagle removed from the cover and album track "Rock 'N Me" excised from the track listing, dropping the number of songs on the album to an even 24 tracks. 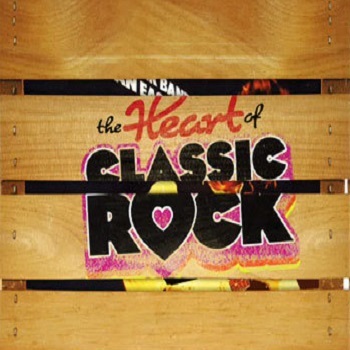 This refreshed version of The Heart Of Classic Rock is being marketed in an expanded set on the interwebs featuring the four volumes from the previously released Easy 80s series from 2011, including Angel Of The Morning, At This Moment, Lost In Love and Secret Lovers. The 114 additional tracks featured on the four double-disc albums are all Adult Contemporary hits from the Eighties. (Look for an Easy 80s feature here on The Hideaway sometime in the future, maybe as part of another Soft Rock Week.) 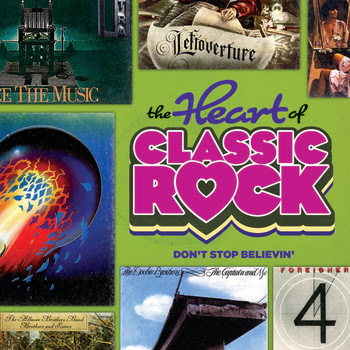 My fellow Spotify user rrale1 took it upon his or herself to create a playlist based on this expanded offering of The Heart Of Classic Rock including the Easy 80s discs and 26 songs from the DVD The 25th Anniversary Rock & Roll Hall Of Fame Concerts for a total of 279 songs. Click here to listen.